Christmas is the season of giving. But what if it was like Christmas in the city all year round? What would that look like? Tallmadge city schools and their Dare to Share (DTS) program feeding students from low-income households give us a glimpse of that. Out of the 18,000 residents in Tallmadge, 10% of live in poverty. Six hundred students receive free and reduced cost lunches in the elementary, middle and high schools. And for the past year, thanks to DTS, kids aren’t coming to school hungry on Monday mornings anymore. “We want kids to be able to learn, and they can’t learn best when they’re hungry. We want them to start school Monday knowing they’ve been fed over the weekend and able to come in and concentrate on what they need to learn,” said Kelley Smith, Family and Consumer Science Teacher, at the High School. But it’s taken a village of caring hearts, community leaders and concerned business men and women to bring about such a big task. 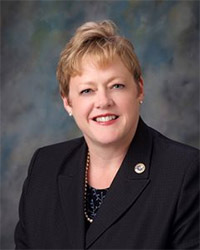 “Several years ago the League of Women Voters put on a program at the High School on food insecurity and hunger,” Kim Ray, Rotary member and City Councilwoman said. The film “A Place at the Table” revealed how many kids in public schools go hungry every day. “I said ‘Thank goodness we don’t have that problem in Tallmadge’,” Ray shared. “The really scary part is that over the past 5 years that number has grown from about 10% to 25% and it just keeps growing every single year,” Ray said. So Ray asked, ‘what can we do to combat that?’ And they developed the DTS program. “It’s not that people don’t care about the issue, it’s that they don’t realize it exists,” she explained. 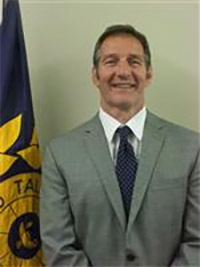 “I got the Rotary and Lions Club involved, the Tallmadge United Methodist Church and Chamber of Commerce, and it just kind of snowballed from there, and has been a fantastic experience” Ray said. What sets them apart is that they donate nutritious food. 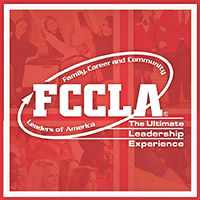 Smith facilitates the work students do through Family Career and Community Leaders of America – a national student organization building leadership through community service. The students determine the menu for the week and fill the bags for their fellow students. “We aim to give the kids 2 fresh pieces of fruit every week. We try to get fresh carrot and veggie sticks, we might bake muffins or banana bread – all made from scratch with wholesome ingredients,” Smith shared. What they give is based on the donations they receive that particular week. But how does this all happen and where do the donations come from? Much of it is from local businesses stepping in and taking the lead. Companies have a lot of power to create change within their communities. Take SD Myers for example. They heard of this local need and didn’t turn a blind eye. 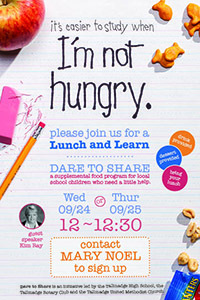 During one of their “Lunch n Learns’” on September 24th and 25th this past year, Ray came in to speak to employees. “Kids come to school 5 days a week and get breakfast and lunch but over the weekend they don’t,” she shared, along with startling statistics. Since sharing this, things haven’t been the same for DTS. 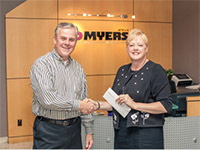 “SD Myers as a company has really adopted the program as their service project for the year. They match every donation with cash,” Ray said. Before SD Myers got involved DTS could only support 16 kids –the “worst case scenario” or most in need. “That’s where we came in,” Mary Noel, Office Manager of SD Myers, said. “The counselors gave a list of kids who were in dire straits and sent out letters to the families. We heard there were 50 on that list that were in need but they didn’t have enough financing to do all 50,” Noel said. So SD Myers asked ‘what’s it going to take for us to help all 50 kids?’ And Kim broke it down into a manageable plan. The company committed to support the program for one year and feed all 50 kids. They do food matching – for every dollar or food item donated, SD Myers matches it monetarily. Donations can also be taken straight out of employee’s paychecks. 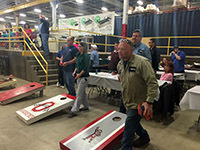 “SD Myers has been doing a lot of fun things, like corn hole tournaments. They’ve had a lot of neat ideas to support the program and raise the cash to help us out. It’s been awesome,” Ray said. “We’ve done several fundraisers that have been quite successful. What we raised was phenomenal,” Noel said. Many SD Myers employees have gotten involved and been touched by this program. “It breaks my heart to think kids go to school hungry or in need of a good pair of shoes. Children are innocent and have no control over their situation. I love the fact SD Myers is getting involved in the Tallmadge community. I was truly shocked at how many kids in Tallmadge are in need,” said Joyce Hall, Payroll/AP Specialist at SD Myers. “I think this program is probably one of the best ones that SD Myers has adopted in the 18 years that I have been here – just knowing that almost 50 children have food over the weekends and are not going to bed hungry. Our employees never cease to amaze me in their giving to others,” Lucinda Ickes, Front Desk Coordinator, said. Ward Jet, Carol Martin Salon and Spa, and Circle Mold have also been running food drives and giving monetary donations. The Tallmadge Chamber of commerce has been giving food donations. “I love the fact that someone would donate a dollar, but I’d rather have a 6 pack of oatmeal because with that I can feed 6 kids. So it’s important to keep the inventory and that’s what the SD Myers employees have been doing,” Ray explained. “It’s really great that the community has gotten behind the program, but the really important thing is that kids are helping kids – and they’re really passionate about it,” Ray said. What if more companies did something like this? What would Tallmadge look like a year from now? Five years? Or even ten years from now? This entry was posted in Charity, Community, Education, Food, Health, Neighborhoods, Poverty, Youth and tagged A Place at the Table, Carol Martin Salon and Spa, Children, Circle Mold, City of Tallmadge, Community Service, Dare to Share Program, Donations, Elementary Schools, Family Career and Community Leaders of America, Giving, Health, High Schools, Hungry, Local Businesses, Middle Schools, Nutritious Foods, Poverty, SD Myers Inc, Tallmadge Chamber of Commerce, Tallmadge City Schools, Tallmadge League of Women Voters, Tallmadge Lions Club, Tallmadge Rotary Club, Tallmadge United Methodist Church, Ward Jet. Bookmark the permalink.